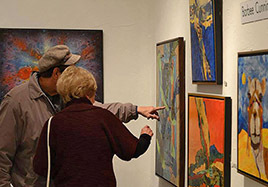 Hop aboard the St. Augustine Sightseeing Trains and Old Town Trolley’s to discover new exhibits at over 20 local galleries on the first Friday of every month from 5-9pm. Celebrate the last Saturday of every month from 5-9pm, with live music and entertainment, refreshments and shopping along San Marco Avenue, between the Ripley’s Museum and the Mission Nombre de Dios. Every Wednesday evening from May through September, enjoy free live concerts at the St. Augustine Beach Pier Pavilion from 7-9pm. It’s the perfect evening out under the stars for couples, friends and family alike. From Memorial Day through Labor Day St. Augustine’s historic Plaza de la Constitucion hosts free evening concerts every Thursday from 7-9pm. 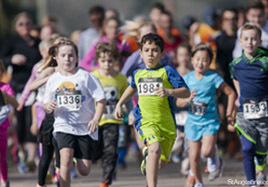 One of Florida’s fastest 5K races and fun runs set along a scenic USATF-certified course that perfect for athletes and participants of all ages and abilities. Flagler College’s cinematic showcase presenting more than 20 foreign and independent films each year, including discussion panels and other interactive events and parties for moviegoers to attend. A festive atmosphere awaits at the the St. Augustine Beach Pier Park for the annual Arts & Crafts Festival. Full of fine arts, live music, food vendors and fun for the whole family. And the best part is that admission is always free! Witness an authentic re-enactment of Capt. Robert Searle’s 1668 attack on St. Augustine, complete with a Raider’s encampment at the Fountain of Youth Archaeological Park and an evening attack at the city’s Plaza de La Constitucion. Will the pirate stela the city’s silver? There’s only one way to find out. Francis Field hosts a St. Patrick’s Day parade with traditional Irish and Scottish music and contemporary rock commemorating St. Augustine’s Celtic history dating all the way back to 1565! Top performers and award-winning barbecue make this non-stop weekend music festival the perfect pairing of favorite pastimes: drinking, dining and dancing! The St. Augustine Municipal Marina hosts decorated sailboats, mega yachts, and every sized vessel in between, during the annual Blessing of Fleet, where boats line up to receive protective prayer from the Bishop of the Diocese of St. Augustine. Beginning at the Mission of Nombre de Dios and winding through the streets of downtown St. Augustine, this parade’s got it all: elaborate floats lead by bold marching bands and drill teams, the fluffy Easter Bunny and the Royal Family in horse drawn carriages donning handmade bonnets. Sample your way through the St. Augustine Amphitheater for the city’s signature food festival, where over 20 local restaurants come together to complete for the prestigious TOStA Awards, including the honor of ‘People’s Choice’ each April. With over 110 classroom sessions, workshops, and special events, this is the perfect opportunity to enhance your photography skills while experiencing Florida’s abundant bird and local wildlife habitats. Come watch your favorite world famous golf pros compete at PLAYERS Stadium Course for one of the biggest prizes and most coveted titles in professional golf at TPC Sawgrass at Ponte Vedra Beach. English buccaneer Sir Francis Drake and his loyal raiders return to St. Augustine each summer to re-enact the 1586 sack of the city. You won’t want to miss the recreation of this wild pirate escapade through the streets of St. Augustine. 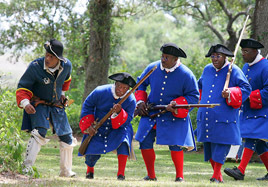 A creative cast of actors recreate the pivotal 1740 Battle of Bloody Mose where former British slaves were granted their freedom by the Spanish militia. Don’t miss this community fireworks display as World Golf Village commemorates Independence Day with a spectacular event suited for guests of all ages. Gaze at colorful bursts above the ancient Castillo de San Marcos over the Matanzas Bay while the All Star Orchestra performs in the Plaza de la Constitucion during one of the largest fireworks displays the East Coast has to offer. Amateurs and professional anglers can compete in this exciting event, offering cash and prizes for the biggest catch. Colorful ceremonies and presentations aide dozens of actors in portraying the 1565 founding of St. Augustine by Spanish colonist Pedro Menendez de Aviles, including his ships landing and a special mass at Mission Nombre De Dios’ outdoor altar. 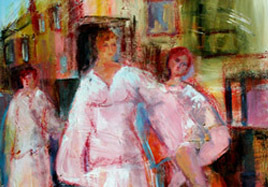 Award-winning authors, publishing professional and fellow book lovers unite to celebrate Florida’s rich literary heritage with a series of readings, presentations, and interactive workshops. 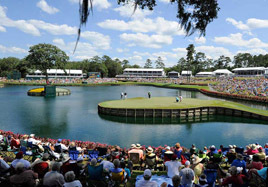 Dye’s Valley course at TPC Sawgrass hosts the culminating event of the Web.com Tour Finals, which determines the 50 players who earn PGA Tour playing priveledges for the upcoming pro golf season. 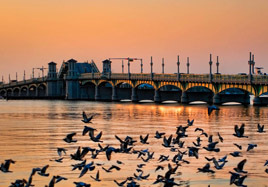 St. Augustine’s rich Spanish heritage is celebrated with this exceptional food and wine festival, featuring outstanding culinary events hosted by multiple venues around town. Be sure to catch the Grand Wine Tasting and the Vino Batalla when you go. Francis Field turns into a bustling village during this weekend festival celebrating all things Greek. 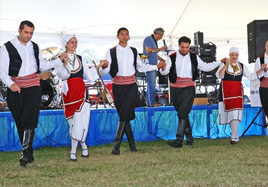 With traditional music and dancers, an authentic Agora market, Cafenio, Taverna, and kids center, complete with carnival rides and games, you won’t want to miss out on all the excitement! 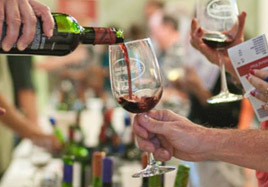 This popular food and wine festival takes place at the River House from noon to 4pm. With 17 participating restaurants and proceeds benefiting the Boys and Girls Club, not only will your appetite be satisfied, but you’ll feel good for giving back too! Local restaurants gather at St. Augustine’s Beach Pier Pavilion between noon and 5pm to compete for the ‘Best of the Beach’ award, while serving up some serious flavor. Admission is free, bites are only $1 each, and you can even participate in the judging while you wine and dine. Dressing Downton, Changing Fashion for Changing Times is an exquisite exhibition of 36 costumes and accessories paired to perfection in engaging vignettes, immersed amongst Otto Lightner's collection of turn of the century fine art and furniture. This remarkable exhibition pairs history with fashion and popular culture with fine art. More than 30 area restaurants come together to compete for the best New England, Minorcan, conch and seafood chowders while raising money for a great cause. Tastes are only $1 each and the proceeds go towards benefiting the Shriners Children’s Hospital. 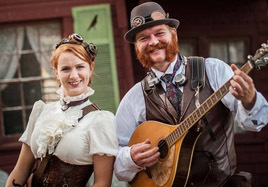 Pick up a parrot, a peg leg and an eye patch and get ready to get rowdy for three full days of fun during the city’s privateer parade and pirate battles, bringing St. Augustine’s rich history back to life with interactive exhibits, demonstrations and raider-worthy parties. 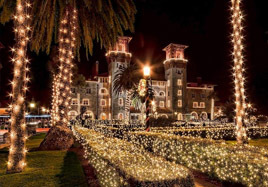 National Geographic named St. Augustine’s Night of Lights as one of the top ten holiday lighting displays in the entire world! Sparkling with over 3 million little lights, this awe-inspiring event reflects the city’s 450-year history and is one you’re sure to remember forever. Make your way down to Francis Field as they welcome over 150 artists from all around the US for this Thanksgiving weekend art festival and fair. Beginning at 10am and winding it’s way downtown, the St. Augustine Christmas Parade is the largest of its kind in all of North Florida. Boasting horses, holiday floats, marching bands, and the highly anticipated arrival of Santa Claus himself, this is one event not to be missed! This special Christmas tour showcases the most outstanding private homes that have been completely decked out for the holidays with lights, ornaments and colorful decorations handcrafted by members of The Garden Club of St. Augustine. St. Augustine Yacht Club hosts this festive parade of brilliantly lit boats that cruise the up and down the Matanzas Bay between the Bridge of Lions and Castillo de San Marcos during the Regatta of Lights. 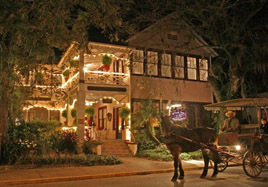 This annual Christmas tour features 24 historic inns throughout the city of St. Augustine, each paired with a local restaurant serving up sweet and savory dishes and drinks. 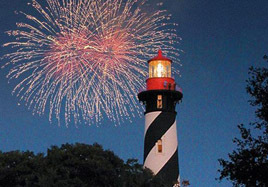 Kickoff the New Year seaside with fireworks, food and fun - the most traditional St. Augustine style of celebration!